Welcome to R. B. 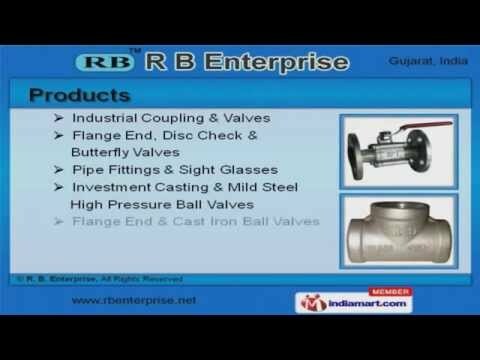 Enterprise, Manufacturer and Supplier of Industrial Couplings and Valves. The Company wasÂ inceptedÂ in 2009, atÂ Ahmedabad. World class infrastructureÂ and RichÂ industry experience make us stand apart from also-rans. Volt as Limited andÂ AdaniÂ Powers Limited are some of our esteemed clients and weÂ are backedÂ by Timely delivery schedules and Complete client satisfaction. Flange End, Disc Check and Butterfly Valves are some of our products. We have gained expertise in presenting a commendable array of Industrial Coupling and Valves. Our Flange End, Disc Check and Butterfly Valves are widely appreciated in the market. We also provide Pipe Fittings and Sight Glasses that are a class apart. Our Investment Casting and Mild Steel High Pressure Ball Valves are cost effective. Along with that we offer Flange End and Cast Iron Ball Valves.